As writers, journalists, artists, and supporters of PEN America, we write to protest the arrest and prosecution of Reuters journalists Wa Lone and Kyaw Soe Oo. We call on the government of Myanmar to drop all charges against them and ensure their immediate and unconditional release. Wa Lone and Kyaw Soe Oo, the winners of the 2018 PEN/Barbey Freedom to Write Award, have been jailed since December 12, 2017 and are currently being tried under the colonial-era Official Secrets Act for possessing documents relating to the humanitarian crisis in Rakhine State. On April 20, Police Captain Moe Yan Naing testified that the two journalists had been framed as part of a police plot to arrest them. At the time of their arrest, the two journalists had been investigating a massacre of Rohingya villagers in the village of Inn Din. The attack was subsequently confirmed by the military, and seven soldiers were sentenced to 10 years hard labor for carrying out the massacre. 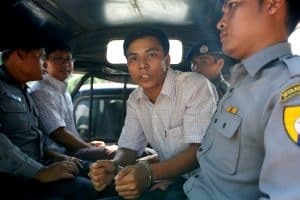 In a painful irony, if they are convicted, Wa Lone and Kyaw Soe Oo both face up to 14 years in prison for the ‘crime’ of bringing the truth to light. The intrepid reporting of Wa Lone and Kyaw Soe Oo comes at a critical juncture for Myanmar and has profound implications for the future of the country. Through their rigorous investigation, the two journalists uncovered vivid photographic evidence and numerous eyewitness accounts of the alleged atrocities occurring in Rakhine State related to a military campaign perpetrated by the Myanmar army, an operation which human rights groups and the United Nations contest amounts to ethnic cleansing. Their work is not only essential in holding the Myanmar government to account for their actions, but also in rallying the international community to confront the ethnic violence and abuses that threaten the Rohingya people. It was with great hope that the world watched Myanmar’s historic November 2015 elections, in which the opposition National League for Democracy (NLD) party won a decisive victory. We, like so many others, hoped that the new civilian-led government would improve the environment for free expression, and ensure that reporters like Wa Lone and Kyaw Soe Oo could conduct their work without fear of reprisals. However, journalists continue to be jailed for their work, while citizens’ ability to be informed about events of national importance, particularly the crisis in Rakhine state, has been severely circumscribed by journalists’ inability to report from the conflict zone. We stand with Wa Lone and Kyaw Soe Oo in solidarity and join with PEN America in raising our voices to protect the values of freedom of expression and a free press. We call on the government of Myanmar to drop all charges against these courageous journalists and ensure that they and others have the right to report freely and without fear of repercussions.